For thousands of years, people have been travelling for the therapeutic benefits of spas, springs and massage therapies. Today, just about every major resort offers spa services, for relaxation, sport injuries, or romance. Over the years, I’ve had some unusual spa treatments. Perhaps these will inspire you to do the same. A cramped, overnight train ride from Mumbai resulted in stiff muscles and one achy Esrock. Walking on a dusty road in the village of Arambol, I saw a sign: Ayurvedic Massage, 1 Hour, $8. Anytime I see a massage that cheap, I pay attention. I was ushered into a small, steaming room. Three men poured a bucket of warm, herbal oil over me, and got to work. Kneading, squeezing, and rubbing my skin with such concentration that sweat dripped from their brows. For thousands of years, Ayurvedic medicine and massage has helped people in India, and now around the world. One thing is for sure: An hour later, I was relaxed, loosened up, and in the perfect mood to explore the beautiful beach towns of Goa. In Taipei, I found myself sprawled on a massage bench in the office of Master Hsieh Ching-long. For more than a dozen years, this fire doctor has been using open flame to untie the knots and heal the muscles of Taiwanese sports and movie stars. He tells me it took years of martial arts training to channel his inner energy so he can use his hands like iron. Lying on my stomach, he pasted herbal goo on my back, doused it with alcohol, and took out a blowtorch. I felt a quick burst of heat, after which the Fire Doctor used his bare hands to spread the flame around. Something smelled like burning skin. My burning skin! Still, with his iron fists, the Fire Doctor hammered out my stiff worries, creaked here, twisted there, and wished me well. Out of the frying pan, and into a scorching summer Taipei day. 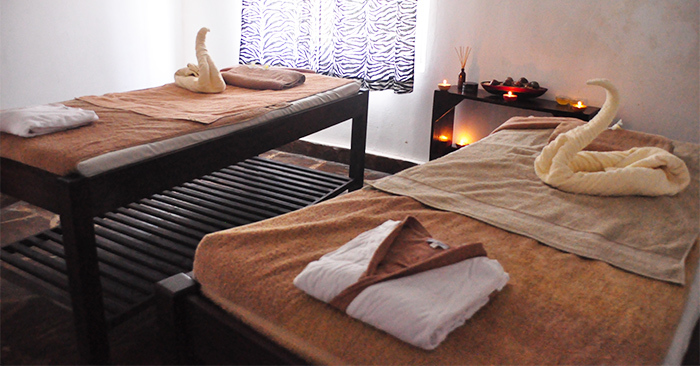 Balinese massage is a mix of aromatherapy, acupressure, stretches, kneading and skin rolling. 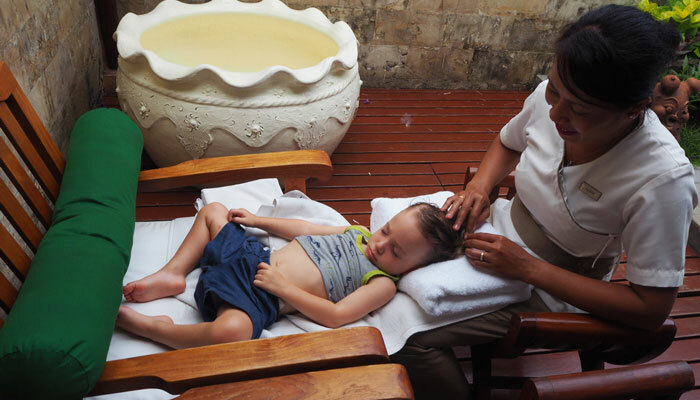 At the fantastic Hotel Nikko in Bali, we were treated to a family spa that relaxed our muscles, put big smiles on your faces, and literally head-massaged my youngest into a blissful slumber. While friendly attendants painted my five year old daughter’s nails, my wife and I became puddles during our couples massage, and while little Gali continued to dream, we transferred him to the bench and us to the large adjacent outdoor bubble bath. In Thailand, massages are as a cheap as a beer back home. Small, lithe masseuses twist and crack joints, often chattering away as they do so. Off Khao San Road, where thousands of backpackers flock to cheap hotels, bars and markets, the massage shops might pack a dozen clients into a single room. Here you can chat to your friends too, in a rather social environment, all the while having your body subjected to the type of pain and discomfort that can only be good for you. Thai massages are heavy on the elbows and knees, penetrating deep into the tissue. Off resort, at $6 to $10 an hour, the price is always right, especially on the beach. In the Georgian capital of Tbilisi, you must visit the famous 17th century Orbeliani bathhouses. Blue tile lines old eggshell domes, housing hot sulfur springs that have been revered for their healing properties for centuries. After my dip, I was shown to an adjacent room and told to lie down naked on a marble slab. A man wearing naught but a small towel came over in the steam and poured a barrel of boiling water over me. He then proceeded to give me a rub down using rough hessian rope, scraping away layers of skin with a thick, foamy soap. It hurt, but not as bad as the sulfuric water poured on afterwards, or when he started walking up and down my back. There is a separate bathhouse for women, but not, alas, for the Georgian Rugby Team, who joined me in the baths shortly afterwards. I had wandered a couple blocks from my hotel looking to experience traditional Chinese acupressure. Based on the same idea as acupuncture, acupressure uses hands, elbows or props to stimulate various pressure points, which help with circulation and energy balance. In a small shop, I was shown to a chair. My feet were scrubbed clean, and then a tiny lady with iron clamps for hands got to work. Pushing and probing, she honed in on my sensitive pressure points, and proceeded to punish them with vigour. My ears were throbbing, my lower back was sweating, my armpits were singing – I don’t know what she was doing, but when she finally stopped, the relief was well worth the agony. Budapest sits above a sea of natural thermal baths, which Turk conquerors once developed into exquisite palaces of swimming pools. There are still several enormous bathing complexes, exhibiting grand architecture, and well-maintained baths. For about $15 you get a locker, and access to dozens of baths of various temperatures, along with saunas, spas, whirlpools, showers, and for a few bucks more, massages. I spent the afternoon at the Szechenayi Baths, amazed there could be so many options to enjoy. Hot, cold, big, small, indoors, outdoors. A large, sour masseuse however, ensured my massage was as tranquil as a Soviet prison. Occasionally I’m lucky enough to travel with my wife. Many resorts offer couples spas as relaxing alternatives to long walks on the beach, or in the mountains. The wonderful Willow Stream Spa at the Fairmont Banff Springs offers various couples packages, encompassing rose-infused side-by-side scrubs, rubs, and baths. In South Africa, we soaked up our pampering at the luxurious Gary Player Health Spa, getting matching facials to enhance our romantic glow. You don’t have to be on your honeymoon to treat yourself to a couples massage. Although after you experience one, you’ll feel like it anyway.